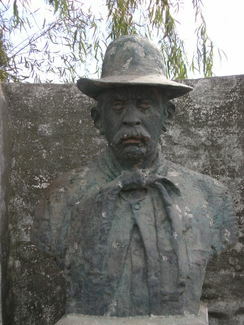 The gaucho is neither the bigger-than-life romantic figure of lore nor dead. 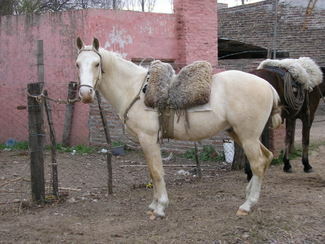 In the central Andes Mountains and Northwest Argentina, gauchos date from the late 16th century. 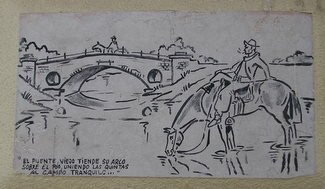 Andalucian Spanish ranchers, Indigenous and Mestizo constituted the genes of these early New World gauchos. 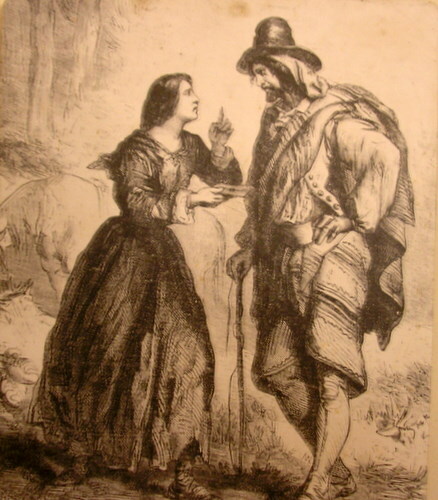 The original gauchos of the Pampas and Patagonia were late 18th and 19th century Basque, Italian, Welsh and Eastern European immigrants seeking jobs on the fertile plains. The estancias still exist and are measured in square miles, not acres. Agriculture remains Argentina's largest export sector. Although mechanization and soy farming has changed the nature of some estancias, grass-fed cattle and sheep are still a major industry. 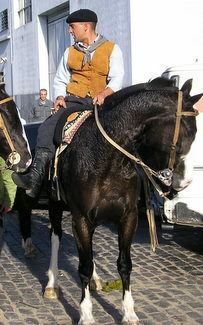 The farm workers may well be the descendants of generations of gauchos. 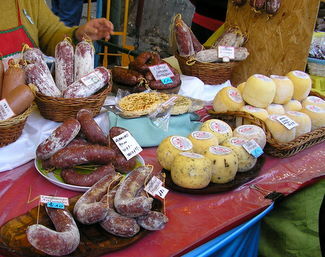 The gaucho/estancia cultural influence is legendary in Argentina: music, dance, literature, fashion, smoked meats, sausage, cheeses and breads. San Antonio de Areco, an easy destination on the Pampas' circuit of traditional towns,including San Isidro , does not overtly hype culture for profit. 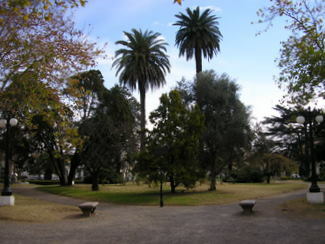 As a day trip from Retiro Bus Terminal, Buenos Aires, it's a comfortable 70 mile, 2-hour one-way excursion. Arrival is at the Chevallier bus station on Route 8 only 6-blocks east of Plaza Ruiz De Arellano. Taxis are available, or it's a 15-minute walk, unless you stop on the way to admire the 19th century tiles that decorate many old houses. 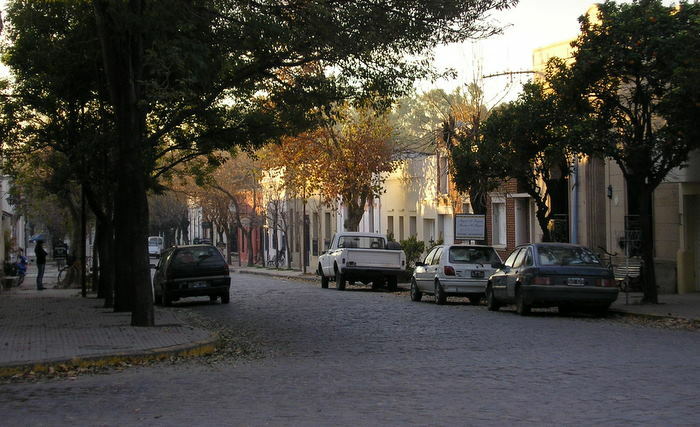 Founded in 1730, San Antonio de Areco is a small town that prospers from the rich agricultural resources of the southern Pampas and summer tourism. Its early architecture is well preserved. 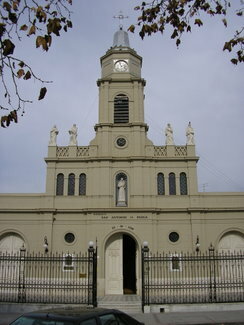 On Plaza Ruiz De Arellano is the historic Iglesia Parroquial San Antonio de Padua. Nineteenth century buildings line the square with galleries and shops selling silver crafts, leather goods, and serious horse related products. 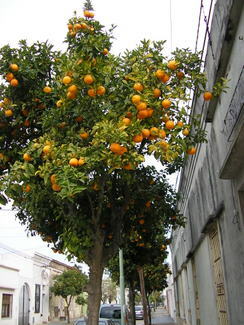 The streets are bordered with bitter-orange trees. In the June winter the oranges seem like decorative ornaments. Creole Park, the Ricardo Güiraldes Gaucho Museum, the Usina Vieja Cultural Center, the Puente Viejo and the Carlos Merti Flora and Fauna Park are all within easy walking distance. 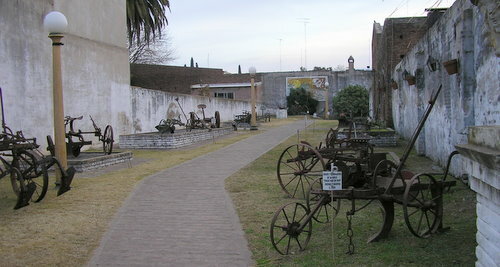 Through well displayed exhibits, preservation and historic reconstruction, these sites and museums portray everyday life in the Pampas. 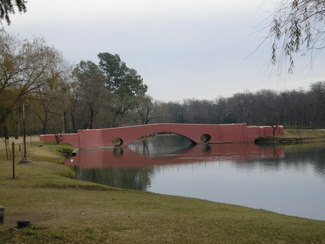 The active Fishermen Club is the base of operations for sport fishing along the Rio Areco. 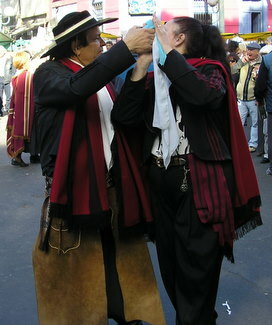 Mid November is the opening of the summer season with the Día de la Tradicion festival celebration of all Las Pampas traditions. 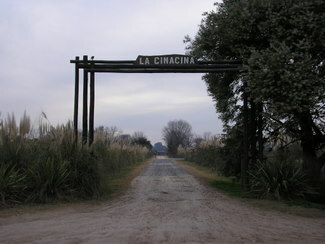 Several estancias offer agricultural and rural tourism: room with full or half board, along with serious horse riding explorations of the Pampas. In season, day activities include gaucho demonstrations and an asado - a large and fragrant outdoor barbeque. 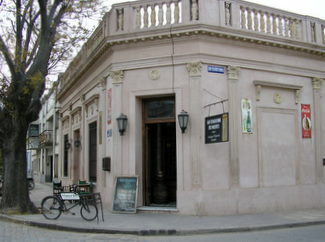 Only 6-blocks west of the Plaza is Estancia La Cinacina. Current information is available from any Buenos Aires tourist office, the San Antonio de Areco tourist office on the Plaza or web search engines. 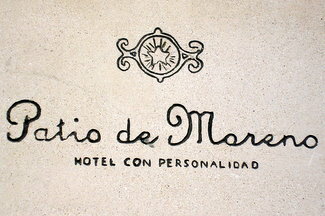 Estancia accommodations are in the luxury range for comfort and amenities. Many Great Houses are listed on the national historic register. Average rates are AR$187.00 - AR$937.00 (US$50 - $250/per person including half or full board and activities). Day activities for non-overnight guests vary but average AR$150 (US$40/per person). The building that today houses Restaurant La Esquina de Merti, on the Plaza, was an early 19th century almacen - the South American equivalent of the general store in the fullest sense. Not just a place to buy any and all provisions, but the very center of popular culture. The local almacen was a pub, a location to raise or resolve business and personal issues, and where news was broadcast before any local paper picked it up. 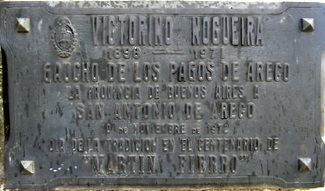 Except in the most rural of Argentine towns, the institution of the almacen is long past. Fortunately, many of their buildings remain and are distinguished by their curved fronts on the corners of plazas. 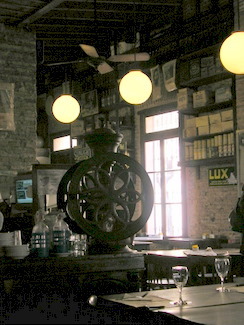 Restaurant La Esquina de Merti preserves most of its original interior - the worn wooden floor, agricultural antiques, an old piano and the store counter as the bar. 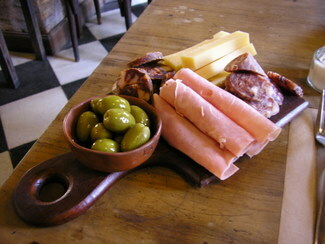 The menu offers a traditional array of grilled meats, fish and a full compliment of smoked meats and sausages. I had a lunch of a simple salad of lettuce, sweet onion and thinly sliced tomato, an assortment of smoked sausages, ham, cheese and anis scented liver pate with crusty bread and mustard and an imaginative dessert, Almendrado: a serving of frozen almond ice cream coated with a sugar/crushed almond mixture is placed under the broiler until the almond coating is lightly browned and served immediately. The warm almond crunch and cold ice cream are both a taste and texture treat. 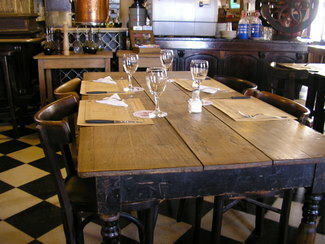 Good lunch and atmosphere for AR$44.00/including 10% tip (US$11.75). Observing the dynamics of the dining table, both as a Chef and a participant is an activity that frequently interests a traveler. When I see the same behavior on multiple occasions I believe some assumptions may be concluded. A family, one table over from mine, had a leisurely lunch with their two teenage sons and a couple other adults. Everyone displayed impeccable manners and were relaxed - greeting friends by rising from their chairs, never once using cell phones, all fully engaged in conversation. Only when the bill was being transacted, did the sons excuse themselves to go outside to use their cell phones. I've had the same observation numerous times over my months in Argentina. The family dined on huge slabs of medium rare grilled beef and fresh fried potatoes. Entrees range from AR$25. - $60. 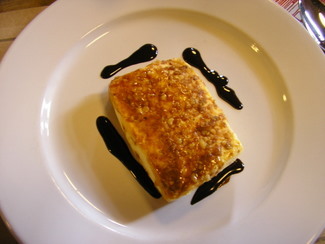 (US$6.65 - $17.00) and add AR$15- $25 (US$4.00 - $6.65) for salad, desert and beverage.